Cunard Line will offer all three ships in Europe for 2019. Choose from a Northern Europe cruise or a Mediterranean voyage with the Queen Mary 2, Queen Victoria or Queen Elizabeth. With so many countries, three continents and thousands of years of history on the itinerary of our Mediterranean cruises, there are plenty of ways to discover this ancient sea. Step into grand cities and laid-back harbours, discover lively resorts and sleepy islands, stand before vibrant modern architecture or age-old wonders. The Mediterranean may be a sophisticated jaunt to French Riviera and Italy's Renaissance treasures. It may take you to the fairy-tale Adriatic to Croatian gems and magical Venice. Enjoy Greek Islands filled with whitewashed villages or reach the imperial splendor of the Black Sea. Explore the many great civilizations once flourished around these shores. A Med cruise offers the perfect opportunity to experience some truly iconic destinations; the Parthenon on the Acropolis in Athens, Rome's Colosseum and other imperial treasures. Quite simply, everything goes. Wander sociable plazas, piazzas and squares, admire Monaco's yachts and supercars or painted fishing boats on Corfu. Watch opera in Naples, vibrant street theatre in Barcelona or Whirling Dervishes in Turkey. Discover the birthplaces of iconic artists, philosophers and writers, or simply follow your instincts wherever you touch shore on your Mediterranean cruise. Cunard History - It was more civilized era, the golden age of sea travel. Crossing the ocean was a grand event unto itself, the very embodiment of sophistication and privilege. And traveling Cunard was what one naturally chose for such a voyage. Cunard's glorious ocean liners were floating palaces of art deco splendor and Edwardian excess, surrounding guests with every comfort and luxury. They attracted the greatest personalities of the day, from world leaders to movie stars, who sipped champagne at festive black tie soirees and strolled along graceful promenades attired in their finest apparel. It was the quintessence of luxury travel, and getting there was truly half the fun. Cunard continues this celebration of style with Queen Mary 2 and Queen Elizabeth 2: proving once again that, with Cunard, the journey may be even more magnificent than the destination. It's more than an elegant and sophisticated style of service. It's how it makes you feel that truly defines Cunard's White Star Service. It comes from the immeasurable sense of satisfaction when greeted by a white gloved attendant who takes your hand luggage to your stateroom. Or perhaps it's the gracious smiles that are de rigueur, as much a part of the uniform of the day as is the crisp, well-tailored attire. You can't help but smile in return. Attentive stateroom stewards create a privileged realm of luxury in each accommodation, turning your room into a sanctuary worth returning to each evening. Our Pillow Concierge ensures that your nocturnal journeys are just as comfortable as your waking ones. You'll find formal British afternoon tea with waiters that are friendly yet unobtrusive. And experienced British nannies who provide care and comfort to our younger guests and their traveling companions. White Star Service is the ultimate in civility, and it's distinctly Cunard. For some, luxury is nowhere more apparent than in their own private corner of the world. It is the unspoken statement made by the choice of residence or the style of accommodations. 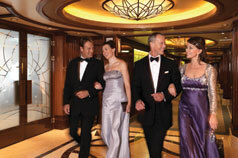 Similarly, at Cunard we believe that your choice is more than simply a place to retire at the end of an eventful day. Our spacious staterooms and suites are a private sanctuary, a home at sea, offering the exquisite decor, fine amenities and innovative technologies one would require for a magnificent ocean-going journey. Imagine spending a day wandering through ancient ruins in Athens, followed by ballroom dancing classes or a night in the casino. A massage and a relaxing dip in the Thalassotherapy pool may be just what you need to help you prepare for the next day's shopping (and other discoveries) in the eternal city of Rome. Sip Sangria in Malaga followed by traditional afternoon tea on deck. It's all possible with your journey through Europe aboard Queen Elizabeth. Embark on a voyage through the Mediterranean, to the kings and conquistadors of Portugal and Spain, where the old ways still hold way. Bask in the beauty of the glamorous Cote d'Azur, with rolling hills that loom over sparkling seas. The Renaissance treasures of Italy await discovery, some tucked away in magnificent museums, while others remain in plain view. And Greek legends can be found along Ionian shores, telling tales of their own of an age that still offers complete enchantment. Crusaders' fortresses, Moorish marvels and the greatest sites of antiquity await. Revisit once mighty empires in Athens, with its Hellenic temples and mythical oracles, and Rome, where millennia old ruins and magnificent churches mingle with bustling cafes and world famous boutiques. Dance with the locals in a lively taverna in Corfu. Or simply relax at outdoor cafes and sandy beaches in the sun-drenched Canary Islands. An unforgettable adventure. Join us on board and you might spot some familiar faces, including writers, actors, film-makers, politicians, explorers, scientists, historians and even the occasional astronaut. Likely as not, it's because they've been invited to inform and entertain you as part of CUNARD INSIGHTS, our regular talks on contemporary issues by well-known celebrities and personalities. There's almost no limit to what you can learn on your holidays. All the speakers add another dimension to your cruise. And that's just the start, with experts on hand to teach you about everything from computers to distant constellations. 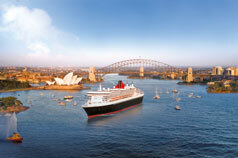 Cunard Line will offer special Musical Event Cruises! 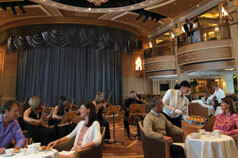 Enjoy exclusive musical events such as Big Band Ball and Jazz at Sea cruises. Upcoming acts include Grammy Award-winning vocalists Gregory Porter, Herbie Hancock and Dee Dee Bridgewater. Talks and Q&A sessions also offer a rare chance to meet your musical heroes. Insights Programme - Cunard Insights Programme is a look behind the scenes. You may listen to academics and ambassadors or meet politicians and film producers who will talk through their careers and answer questions. Book Clubs - The Cunard Book Club offers the opportunity for literary discussions among our passengers. Book selections will change quarterly and are reflective of the interests of each ship's guests. iStudy Classes - Perhaps you want to learn more about the latest computers, accessories and software - iStudy classes will take the mystery out of today's technology. Royal Academy of Dramatic Art - Arguably the most famous acting school in the English-speaking world, London's Royal Academy of Dramatic Art (RADA) has a unique relationship with Cunard. The RADA graduate company presents specially-edited versions of renowned plays and adaptations of great literary classics on Transatlantic Cruises, each lasting no more than an hour. Royal Astronomical Society - For more otherworldly subjects, our Royal Astronomical Society (RAS) partnership puts distant stars and galaxies into focus. Head over to the planetarium to enjoy specially created shows explaining what you can see in the night sky at different times of the year. Using telescopes and binoculars, our RAS expert can also point you in the right direction to gaze at the Milky way from deck. A holiday with Cunard is all about relaxation and making exactly what you want of your day. With that in mind you shouldn't need to worry about paying for things like food and entertainment. As with an all inclusive holiday, your food is included in the price of your cruise, so you won't have to fork out to enjoy dinner. You'll also find that most activities and entertainment are included too. A choice of Britannia, Britannia Club, Princess Grill and Queens Grill staterooms and suites. All en suite and air conditioned. Nightly turndown service. 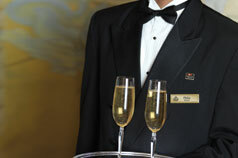 Your steward will look to ensure your stateroom or suite is always pristine. Satellite TV (with multi-language film and music channels). Breakfast, lunch and dinner are available in the main restaurants. Traditional afternoon tea is served each day in the Queens Room. Breakfast, lunch, dinner and snacks along with tea, coffee, water and fruit juice are all available 24 hours a day at the buffet restaurants. Comedy and drama shows, Shakespeare classics and spectacular musical productions in the Royal Court Theatre. Cunard Insights - talks on a range of issues by well-known celebrities and experts. Go dancing in the nightclub or Queens Room. Live music from resident bands to jazz ensembles and classical recitals to singers. 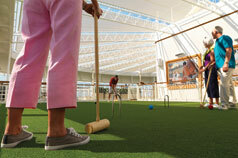 Full use of the sports court for football, deck tennis, basketball and more. A choice of swimming pools and whirlpool spas.